"We're not just the Rotary with a pointy roof"
I'm reading a book by Rowan Williams, former Archbishop of Canterbury, called Being Disciples: Essentials of the Christian Life. I really love it and will probably write more about it later. We who make up the Church aren't just the Rotary with a pointy roof. That's often forgotten, even by church members, ostensibly disciples of Jesus Christ on a life and death mission from the Lord to be and make disciples. That fact will cause us to do what Welby calls "voluntary work," like the folks from the congregation I serve here who go each year to do real service in Haiti, Appalachia, India, and elsewhere. Or the others who will feed 150 men at a Dayton homeless shelter next weekend. Or those Living Water disciples who tutor impoverished kids or run the local Upward sports program. But we do those things not because we're just a bunch of community do-gooders. The Rotary is nice. But the Church plays for bigger stakes: The eternal good of everyone we encounter. Whatever good we do comes from and is all about Jesus alone. There's nothing wrong we Rotarians, but we Christians commit acts of service because Jesus died and rose for us, liberated us to love God and love neighbor, and has sent us into the world filled with Christ's love not only to do loving things but to share the Good News of Jesus' death and resurrection that can change people's lives now and in eternity, when they turn from sin and entrust their lives to Him. In fact, at Living Water, we don't even have a conventional "pointy roof," by which I imagine Welby means a steeple. It's people who rightly confess Christ and rightly share in the Sacraments of Holy Baptism and Holy Communion that make up the Church. And having been made into the Church by the Three-in-One God, we serve others prolifically for much higher stakes than just relieving their discomfort, poverty, or pain. We serve to be windows onto the loving soul of God. Our serving gives a simple message: If God can turn someone like me into a confident, loving ambassador for Christ, He can change anyone's life for the better forever. Doing the prep work for our next discipleship small group gathering, the workbook poses this question: "What are some similarities between the way children obey their parents and the ways Christians obey God?" 1. Both (sometimes) trust that that God or our parents have our best interests in mind. 2. We sometimes obey in spite of what it is we really want to do. 3. We sometimes obey begrudgingly. 4. When we trust God or parents, we trust that obedience is the best thing. Famed psychologist and psychotherapist Erik Erikson said that human development happens as we successfully negotiate a series of certain internal conflicts over the course of our lives. The first one to be negotiated, he said, is trust v. mistrust. This conflict is played out initially in our homes, with our parents. Throughout our lives, we must deal with the question of whether we trust ourselves most of all. The gospel about Jesus Christ, God in the flesh Who bears our sins on the cross, accepting our punishment for our failure to trust God and all the selfish, loveless acts and ways of thinking that result, then rises to open up an eternity built on a trusting relationship with God and His grace, is the only thing that can overcome our original sin, our failure to trust. As Erikson suggests, the remnants of our trust v. mistrust conflict remains with us our whole lives. But the Christian knows that we are changed, in the words of 'Amazing Grace, "the hour [we] first believed..."
When, by the Holy Spirit's power, we're able to confess our sin, our need of a Savior and Lord, and acknowledge that Christ is that Savior and Lord, God goes to work to help us become to trust Him and be set free to love God and love neighbor (Mark 1:14-15; 1 Corinthians 12:3). But, this side of the grave, the work is never completed. At present, we see through a glass darkly, to use Saint Paul's image, and we know only in part (1 Corinthians 13:12). (1) there are times when I disobey God's will for my life, even though, because of my gratitude for His grace, I want to obey Him. When this happens and I wake up to see the truth, I need to turn back to Him for forgiveness and the power to live differently. (2) there are (many) times when I do or refrain from doing what God wants me to do, even though I would rather go in another direction. There are some people who claim that Christians project their experience as children with parents onto an imagined God, that God's Word is a figment of the human imagination. In fact, they have things backwards: God is Abba, our Father and Creator. And when He created flesh and blood human beings, He gave them parents, whose functions in their children's lives is to mirror God's approach to the whole human race. God gives life, loves, nurtures, guides, and disciplines. He does this all through the agency of His Church. Parents are to do the same things with their children. Parents like these, despite their imperfections, will elicit the trust of their children. God, always perfect, can elicit the same trust from us for Him when we open ourselves to His grace given only in Jesus Christ. But that doesn't mean that obeying the God Who loves us with infinite passion is easy. It isn't. And apart from His grace and love given in Christ, we wouldn't even think to try. This is isolated on George Harrison's lead vocal, with Paul McCartney's harmony, on I Need You. Harrison composed the song and it was included in the Beatles' second feature film, Help. As readers of the blog may know, I try to spend some time five days a week in quiet time with God: reading His Word and asking Him to show me the truth He wants me to see and respond to for that day. Below is today's journal entry for my quiet time. If it can, as my Navigators coach Bill Mowry says, "prime the pump" for your own relationship with God, that's great. But there is no substitute for spending time in God's Word each day yourself. To soak up His Word is to get to know our awesome, amazing God better. And knowing God better is the deepest yearning of every human being, whether they know it or not: Everyone longs to know the One in Whose image they were created! The discussion in 1 Corinthians 11, of headwear by women and men is so obviously time-bound and tied to Jewish worship customs and Paul’s contextual plea for Gentile-Christians to have consideration of Jewish-Christian sensibilities, that I pass over it. The discussion of Holy Communion in the chapter, though, clearly has application for Christians beyond the first century, even though it addresses it within the context of the agape meal, which isn't how Christians ordinarily celebrate Holy Communion these days. I’m especially struck by this verse, which I’ve never taken the time to consider before. Paul seems to be saying that if a person doesn’t perceive the real presence of Christ in the Sacrament, they bring judgment on themselves. In fact, I believe that it is what he is saying. The pivotal word is the verb, discerning. The word in Greek, the language in which Paul and all of the New Testament writers composed their work, is διακρίνων (diakrinōn). That’s the passive, plural, nominative form of διακρίνω (diakrinó). It’s a compound word and a literal rendering might read to judge through. In other words, to see something in an object, person, or situation beyond its surface presentation, to see it for what it is in its entirety. As it relates to Holy Communion then, Paul appears to be saying that when we receive the bread and wine of Holy Communion, the eyes of faith see that it is more than just bread and wine. In the sacrament, Christ gives His very self--body, blood, His all--to us. Failing to trust the promise that Christ gives here to be in, with, and under the bread and the wine is, Paul says, to bring judgment on ourselves. Listen: Why does God’s Word insist on the importance of discerning Jesus’ actual body in the sacrament? One reason may be is that He wants us to accept what it is that Jesus says. Jesus expects us to believe that He knows what the meaning of is is. 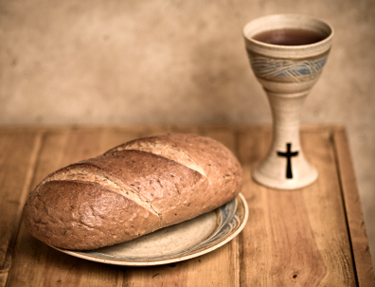 He calls (He commands) us to accept the reality that, through the blessing of His Word, bread and wine become simultaneously His body and blood. In the Sacrament, He re-enacts the miracle of God’s incarnation in Christ. Christ incarnates Himself in, with, and under the bread and the wine and fills us with Himself. Just as Christ was and is both truly God and truly human, in the Sacrament, believers are presented with what is both truly earthly food and truly Jesus Himself. If this promise isn’t met by faith, both in the Giver and in the gift He gives, there is no forgiveness. To view the Sacrament as a symbolic religious act is to not receive what Jesus seeks to give. To receive it as an act of Jesus, God-in-the-flesh, with trust--or, what is most possible for us merely from a human point of view, the willingness to trust, since we are incapable of believing in Christ or His promises apart from the faith-creating work of the Holy Spirit (1 Corinthians 12:3)--is to receive exactly what Christ intends to give through it. To trust in Christ's presence in, with, and under the bread and the wine is nothing more and nothing less than believing in, or trusting in, Jesus (John 3:16-18). I think that receiving it with trust doesn’t mean we have to understand it. Who has the mind to understand it fully? This isn’t a philosophical proposition to be understood, but a mysterious act of love to be accepted...or spurned. I didn't preach today, but our worship director, Mark Brennan, presented an excellent sermon, which you can find here.